This time around we talk to Sylvia Edge-Perkins, who teaches Pilates at Healium. 1. What is your favorite thing about Pilates? It's almost infinitely adaptable - I've had students do Pilates in a leg cast. Or in bed. 2. What is your favorite Pilates movement? 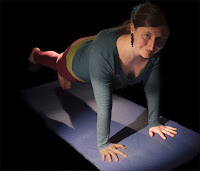 The roll-up: from lying on the back, peeling the spine off the floor from the top of the head and reaching the upper body forward over the legs before stacking up into a seated position. It's a really satisfying movement, particularly as many people take a while to "get" it, so it's super-exciting when they do. 3. What is your favorite thing to teach? Right now I'm really into upper-body posture - the placement of the shoulder blades, rib cage, arms and head. Often people live in a small, forward-oriented range of their available posture, and it's really exciting to see their upper body open up as they learn to stack themselves up tall. 4. What is your favorite movement to teach? Pilates press-ups, because there's so much in them! Press-ups are a full-body workout, but the Pilates version breaks the set-up into easier-to-manage chunks by adding calf raises, spinal articulation and stretching, and my beloved plank position. 5. What is your favorite thing to do other than practice and teach Pilates? I love to dance! 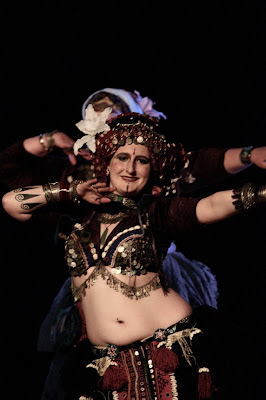 I teach and perform American Tribal Style bellydance, which is an amazing format for group improvisation in bellydance. It all ties in with my love of movement and the awesomeness of the human body fostered by yoga and Pilates.